This Mediterranean beauty will add height, colour and sweet fragrance to your garden for years! A mass of sumptuous white, sweetly-scented flowers & luxurious evergreen foliage! Flowering all summer long, Oleanders are wonderfully exotic, yet UK winter hardy to -5C too. Very easy to grow - it will literally thrive on neglect and loves hot, dry weather. Supplied as 65cm (2ft) tall plant, in a 3L pot. Breathtaking! Winter Hardy Standard Oleander A Mass of Sweetly Scented White Flowers & Luxurious Evergreen Foliage! 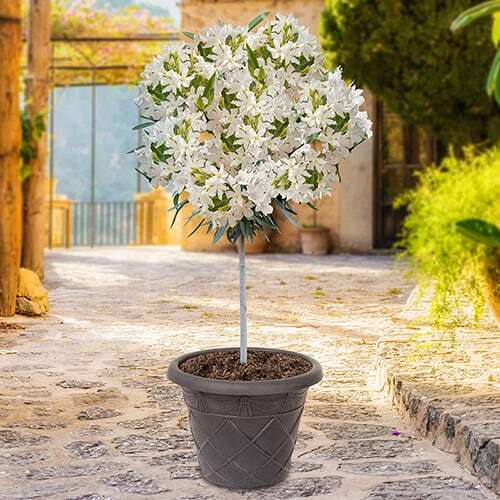 A magnificent addition to any patio or balcony, this stunning, winter-hardy Standard Oleander will create a wonderful fragrance and a Mediterranean feel all summer long. Gorgeous, sweet scent from its exotic, pure white blooms will gently waft through the warm air in your garden simply delightful in early evenings in the summer.Flowering all summer long, it is wonderfully exotic, yet incredibly it is UK winter hardy to -5C too. Very easy to grow it will literally thrive on neglect and loves hot, dry weather. No wonder Oleanders are such a big favourite with UK plant lovers! This Mediterranean beauty will add height, vivid colour and sweet fragrance to your garden for years to come. Supplied as a fully established plant in a 3L pot and 65cm (2ft) tall. Will grow approx. 10cm per year in the UK. Supplied as a fully established plant in a 3L pot and 65cm (2ft) tall. Will grow approx. 10cm per year in the UK. Important: Contact with oleander foliage and its sap may irritate the skin. All parts of the Oleander plant are toxic if ingested.